Recovery efforts are underway and resources available for the community. Reno, Nevada. Jan. 9, 2017. Washoe County, City of Reno and City of Sparks emergency officials are shifting their focus to recovery efforts following widespread flooding in the region in the aftermath of heavy rains. Ensuring public safety and providing resources to the community remain the highest priorities today. The Reno-Sparks Indian Colony (RSIC) is changing its emergency operations to recovery operations today, after RSCI Chairman Arlan D. Melendez signed a Declaration of an Emergency Disaster. RSIC crews focused on flooding at the Reno-Sparks Tribal Health Center and mudslides along Eagle Canyon Road. All updates will be posted on this page. ﻿Scroll down to see earlier updates. Reno, Nevada. Jan. 9, 2017 – Washoe County, City of Reno and City of Sparks emergency officials are urging citizens to avoid nonessential travel this morning as widespread flooding continues in Washoe County. Drivers should be extra cautious of standing water and debris if they must travel on area roads. Sierra St. between N. Virginia St. and 15th St.
Offenhauser Dr. at Portman Ave.
Aquila Ave. between Plumb Ln. and Thomas Jefferson Dr.
9th St. between Lake St. and Evans Ave.
Gateway Dr. at Offenhauser Dr.
Several significant road closures continue to impact the community, which will affect the morning commute. 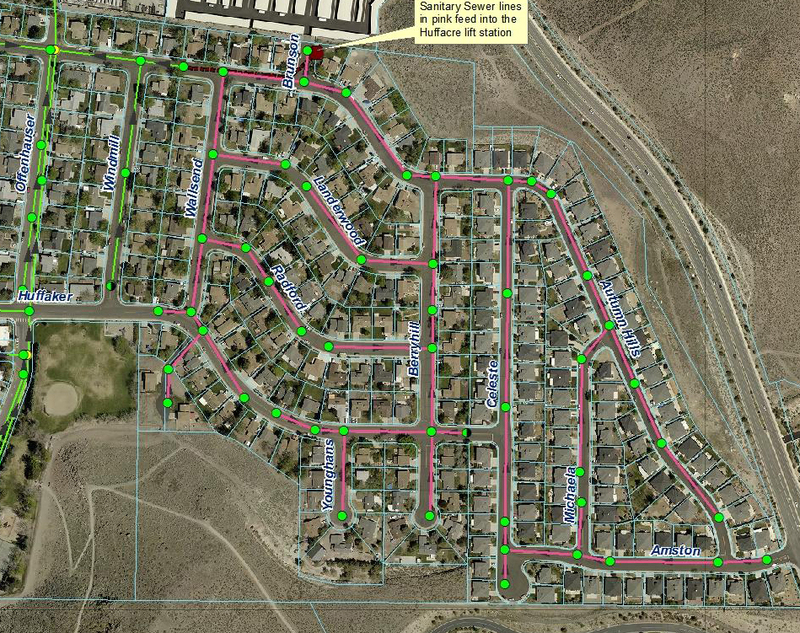 These include large sections of McCarran Boulevard, some downtown bridges, several streets in the Hidden Valley area, and several streets in the Lemmon Valley area. Road access in and out of Pyramid Lake (State Routes 445, 446 and 447) remains closed. Damage assessment teams will be deployed today to tour the region and determine flood impact and necessary cleanup. Voluntary evacuations are now in place for 19 dwellings in the Hidden Valley area, due to rising waters. These include dwellings on Pebble Beach Drive, Pelham Drive and Plum Hollow Circle. According to current information, the Truckee River crested, or reached its highest level, in downtown Reno at around 12:45 a.m. The river is now expected to crest in Sparks some time between 10 a.m. and noon on Monday, which could cause substantial flooding in the Sparks industrial area. Reno, Nevada. Jan. 9, 2017 – Washoe County, City of Reno and City of Sparks emergency officials are monitoring conditions as widespread flooding continues in Washoe County. According to current information, the Truckee River is beginning to level off in downtown Reno. The river is expected to crest in Sparks some time between 6 a.m. and noon on Monday. Three roads traveling to Pyramid Lake have been washed out and the Nevada Department of Transportation is currently working to re-establish access. State Route 445 from Sparks to Sutcliffe and State Route 447 from Wadsworth to Gerlach are currently inaccessible. State Route 446 is inaccessible from mile marker 3 to State Street. Emergency services from Pyramid Lake Paiute Tribe are still available for people in Nixon, Sutcliffe and Wadsworth. For more information, contact 775-574-2426. Throughout northern Nevada, there have been reports of drivers going around or through posted road closures. Please obey signs, which are there for the safety of drivers, and do not drive in floodwaters. Nonessential travel should be avoided at this time. If you have to drive on roads that are open, be extremely cautious and watch for debris. Several dwellings have been evacuated at this time. Residents in the Quilici Drive, Autumn Hills Drive and North Edison Way areas are under voluntary evacuation. Nearly 400 dwellings and nine commercial structures were evacuated in total. The Autumn Hills Drive area is also affected by a sewer lift station failure that has created a health hazard. Flood waters and tap water should be considered contaminated. Voluntary evacuations are in place in the area bound by Autumn Hills Drive, Amston Road, Huffaker Lane and Offenhauser Drive. The cause of the sewer lift station failure in that area is not yet known, and won’t be until water levels recede and crews can assess the damage. The Wooster High School evacuation center is full. There are approximately 200 people and nine small animals staying there. People who need a place to stay are encouraged to go to the evacuation center at Sparks High School. There are approximately five people and one small animal staying there. Washoe County has additional closures listed here. Officials will be updating media and the public continuously at www.washoecounty.us. People are urged to follow the conversation on social media using the hashtag #NVFlood17, or by calling 2-1-1 for information. There have been 1,302 calls made to 2-1-1 yesterday and today. Reno, Nevada. Jan. 8, 2017. Washoe County, City of Reno and City of Sparks emergency officials continue to monitor precipitation and flood information as weather conditions continue to deteriorate. Widespread flooding is occurring in Washoe County. According to current information, the Truckee River is expected to crest, or reach its highest level, around 10 p.m. on Sunday in Reno, and between 1-3 a.m. on Monday in Sparks. See more info from Sparks. Please see attached rainfall map. Several homes have been evacuated at this time. Residents in the Quilici Street, Autumn Hills Drive and North Edison Way areas should evacuate. The Autumn Hills Drive area is also affected by a sewer lift station failure that has created a health hazard. Voluntary evacuations are in place in the area bound by Autumn Hills Drive, Amston Road, Huffaker Lane and Offenhauser Drive. Please see the attached map for evacuation areas. All streets on the map are in the evacuation zone. The Wooster High School evacuation center is full. People who need a place to stay are encouraged to go to the evacuation center at Sparks High School. Please check road closure information. The following places will be closed tomorrow, Monday January 9, 2017. Reno City Hall. Reno Direct will not be staffed tomorrow. City of Reno residents should continue to call 2-1-1 for non-emergency information. The Regional Transportation Commission (RTC) is offering free transit rides from now through midnight on January 10, 2017. People should check www.RTCWashoe.com for detours or cancelation of routes. An exclusion zone with has been set up on both sides of the river by the Reno Fire Department and Truckee Meadows Fire Protection District from the stateline to the City of Sparks, due to life and safety issues. Per the International Fire Code, recreational river-goers or observers within 100 feet of the water could be cited with misdemeanors. 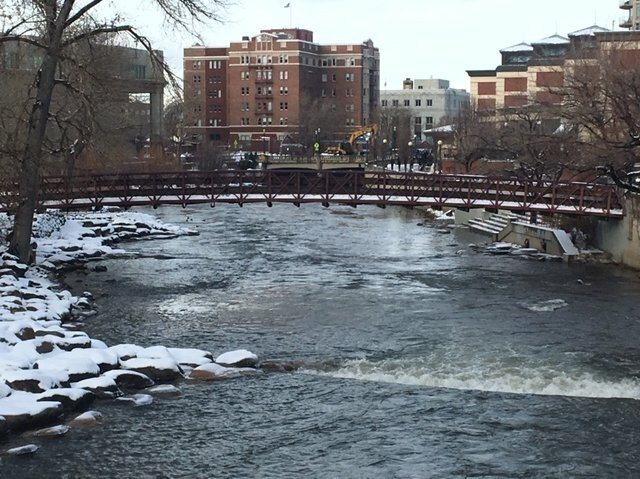 First responders are also urging the public to stay away from the Truckee River. If first responders have to perform river rescues, it will divert valuable resources away from the flood response. Treat any flood water as contaminated water. The water could include sewage and fertilizer or other contaminants. Stay out of the water and keep pets out of the water, as well. Flash flooding can happen quickly and can be very dangerous. The water is very cold and hypothermia could set in quickly. Obey signs, including road closures and do not drive in floodwaters. If you can’t see the ground, you don’t know how deep the water is, if the road is washed out or if you’ll get stuck in debris. Downed power lines could also pose an electrocution risk. Don’t drown, turn around. Officials will be updating media and the public continuously at www.washoecounty.us. People are urged to follow the conversation on social media using the hashtag #NVFlood17, or by calling 2-1-1 for information. In an emergency situation, please call 9-1-1. Reno, Nevada. Jan. 8, 2017 – Washoe County, City of Reno and City of Sparks officials continue to prepare for a significant flood event that will strongly impact the region today, Sunday, January 8, 2017. The forecast shows flooding starting at around 2 p.m. today in downtown Reno and possibly lasting through around noon tomorrow, according to the National Weather Service in Reno. The Truckee River Flood Management Authority has released a new set of maps showing the simulated flooding. The maps are available online. Please review the maps and prepare for flooding. Flood events are unpredictable, and officials are keeping an eye on downtown Reno, the Steamboat Creek area including low-lying areas of Damonte Ranch, the Hidden Valley subdivision and nearby areas, and the Rosewood Lakes area. The Reno-Tahoe International Airport is now forecast to flood less than projected, but this does not mean that the flood risk has decreased in other areas. The City of Reno, the City of Sparks and Washoe County have closed all public parks located along the Truckee River. Temperatures and snow elevations are changing rapidly. Snowmelt is unpredictable and is causing water runoff to go in unexpected directions. Evacuation centers are open at Sparks High, Wooster High and Natchez Elementary in Wadsworth. The flood waters are extremely dangerous. Flash floods can happen without warning. The water is fast and cold, which can be a deadly combination. Hypothermia can set in quickly. Please treat any flood water as contaminated water, as it could include sewage, fertilizer and other contaminants. Please keep pets out of the water, too, as they could absorb contaminants and transfer them to humans. Do not drive in floodwaters. If you cannot see the ground, you don’t know the water’s depth. The road could be washed out, or you could get stuck in debris. Downed power lines could also pose an electrocution risk. Don’t drown, turn around. Washoe County Sheriff Chuck Allen said he has increased staffing throughout this event. However, response time could be delayed due to weather conditions and increased call volume. There will be several road closures. Officials will be updating media and the public throughout the day at washoecounty.us. People are urged to follow the conversation on social media using the hashtag #NVFlood17, or by calling 211 for information. In an emergency situation, please call 911. What: Officials from the Regional Emergency Operations Center will be holding a press briefing regarding projected floods. Details: Washoe County, City of Reno and City of Sparks officials continue to prepare for a significant flood event that will strongly impact the region starting today. Heavy rain is expected, leading to an increased threat for flooding near the Truckee River, as well as creeks, streams, drainage ditches, urban areas, farmland and burn areas. The briefing will provide an update with the most recent information as well as flood and storm projections. Editor’s Note: After the briefing officials will be available for individual interviews. Through an escorted tour, media will have the opportunity to obtain footage and photos in the Regional Emergency Operations Center. Saturday 2:45 p.m. - Arlington & Sierra Bridges open with restrictions. Reno, Nevada. Jan. 7, 2017. Two bridges in the City of Reno, the Arlington and Sierra bridges, are open with restrictions. Those bridges were scheduled to close today for potential flooding, but they are now open with restrictions. The Lake Street Bridge continues to be closed. Saturday 1 p.m. - Northern Nevada regional partners continue to prepare for significant flood event. Reno, Nevada. Jan. 7, 2017. Washoe County, City of Reno and City of Sparks officials continue to prepare for a significant flood event that will strongly impact the region starting tomorrow, Sunday, January 8, 2017. Heavy rain is expected, leading to an increased threat for flooding near the Truckee River, as well as creeks, streams, drainage ditches, urban areas, farmland and burn areas. Washoe County Emergency Manager Aaron Kenneston reminded officials from the various agencies today that the region is still in Flood Alert Stage. The Regional Emergency Operations Center has been activated for the duration of the event. According to the National Weather Service in Reno, there is a Flood Warning in effect from approximately 1 p.m. on Sunday to approximately 11 p.m. Monday. Anticipated peak flooding times will be between 5-8 p.m. on Sunday in Reno, and 3-7 a.m. on Monday in Sparks. Residents are advised to stay home, if possible, and to avoid nonessential travel in order to stay safe and with respect to emergency operations. Residents should be cautious that flood waters could be sewer contaminated. View Washoe County Health District Flood Health & Safety Information. Wooster High School and Sparks High School have been activated as the primary regional shelters as of today at noon. People and small animals are welcome at these locations. For large livestock animals, residents should use the Reno-Sparks Livestock Events Center (1350 N. Wells Avenue in Reno). They can enter at Gate 6 off of Sutro Street. Citizens are urged to please use sandbags prudently, with respect to the high demand. Please be advised that all Washoe County School District schools are canceled for Monday, January 9, 2017 due to predicted severe and dangerous weather conditions. The school district will review weather implications for Incline Village schools on Sunday, January 8, 2017 and will contact Incline families if schools are safely able to open there. Visit washoeschools.net for further updates. In anticipation of significant flooding, several downtown Reno buildings will be closed on Monday morning, including the three courts: Reno Municipal Court, Second Judicial District Court and Reno Justice Court. Alternatively, the Jan Evans Juvenile Justice Center will remain open. Veterans Court will be held at Jan Evans Juvenile Justice Center at 650 Ferrari-McLeod Blvd., Reno 89512. Veterans Court participants should arrive at 9:30 a.m. Temporary Protection Order (TPO) applicants may go to the Jan Evans Juvenile Justice Center at Ferrari-McLeod Blvd between 9 a.m. and 3 p.m. to complete a TPO application or call 775-328-3468 for assistance. January 9 will be a non-judicial day for purposes of calculating filing deadlines. The Downtown Reno Library will be closed, along with several businesses. Because the flooding is likely to occur through Monday, it is important to understand that flood-prone facilities will likely be inaccessible on Monday morning. The following City of Reno bridge closures will happen at 2 p.m. today: Lake, Arlington and Sierra. The Sparks industrial area will be severely impacted. For more information on how the City of Sparks is preparing for the storm, go to cityofsparks.us. No Regional Transportation Commission routes are inoperable at this time, but RTC is assessing based on changing conditions. Riders should plan for possible delays due to road conditions. The Reno-Tahoe Airport Authority leadership team will be manning the airport emergency operation center starting tomorrow afternoon. Airport officials have been working in close concert with the National Weather Service and the Washoe County emergency management team for the past 10 days planning for the storm. The airport has communicated to all the airlines and tenants that there is a flood risk. The airport has filled 2,000 sandbags and have more if needed. Call 2-1-1 if you have non-emergency questions, follow the hashtag #NVFlood17 on social media, or use the specific communications channels for each entity described below. For more information, visit washoecounty.us. *Call 9-1-1 in an emergency situation. Media and the public are encouraged to ask questions and share information on social media by using the hashtag #NVFlood17. In addition, Washoe County Emergency Manager Aaron Kenneston has elevated the alert stage from Monitoring Stage to Flood Alert Stage, which occurs 48 hours before flooding is expected. See flood projection maps. The Regional Emergency Operations Center has been activated for the duration of the event. According to the National Weather Service in Reno, there is a Flood Warning in effect from Sunday to Monday. Residents should also be prepared for a Winter Weather Advisory on Saturday, Jan. 7, 2017, from 4 a.m. to 4 p.m. Saturday’s storm could bring more snow to the region. Sparks High School is being established as the primary shelter and will be open Saturday, Jan. 7, 2017 at noon. Wooster High School is on standby, should a secondary shelter be needed. Call 2-1-1 if you have non-emergency questions, follow the hashtag #NVFlood17 on social media, or use the specific communications channels for each entity described below. For more information, visit www.washoecounty.us. Media and the public are encouraged to ask questions and share information on social media by using the hashtag #NVFlood17. For the latest information on Twitter, follow us at www.twitter.com/washoecounty. The Washoe County Roads Division is busy making sure roads are as safe as possible. There are nine sandbag locations available throughout unincorporated Washoe County. See the complete list. Avalanche danger continues to exist in the Sierra. The Washoe County Sheriff’s Office urges citizens to stay out of the backcountry until the danger passes. Avalanche experts have also expressed concern about a high probability of an avalanche in the Third Creek drainage area above Incline Village. At this time, we do not believe homes in the area are threatened. Washoe County Regional Animal Services will have the Reno Livestock Events Center available as a shelter for residents with animals in flood prone areas beginning Saturday, Jan. 7, at noon. Washoe County School District will continue to evaluate the situation and a decision on possible school closures or delays will be announced as soon as possible. Public Works will be working around the clock until there is no longer a concern for public safety. Crews will be clearing storm drains to avoid water over roadways and preparing for potential flooding along the Truckee River by filling sandbags, removing debris, and inspecting bridges in high-flow areas. This includes the following bridge closures starting tomorrow at noon: Arlington, Lake and Sierra bridges. The Reno Fire Department and the Reno Police Department are both adding additional staffing over the weekend to prepare for potential emergency situations. Sandbags are available at six locations. Locations can be found at Reno.Gov/News. Businesses and residents along the Truckee River corridor should be on high alert and take precautions to protect their property. The public and City of Reno employees should anticipate the closure of Reno City Hall on Monday morning, and plan accordingly. For more information on how the City of Sparks is preparing for the storm, go to www.cityofsparks.us. Due to predicted flooding, RTC bus routes may be inoperable in flood-prone areas as conditions warrant. All riders are advised to plan ahead and monitor www.rtcwashoe.com for updated information. Click on Transit Alerts. Additionally, RTC buses are on standby to assist with evacuations this weekend and early next week if called on by first-responders or law enforcement. However, residents should plan on being self-sufficient during the flood emergency and prepare in advance. Precautions for flooding are also taking place at RTC construction sites, such as moving equipment to higher ground. The RTC encourages everyone to monitor media reports and to be safe and prepared. For those interested in volunteering, contact Northern Nevada Red Cross at 775-770-0899.